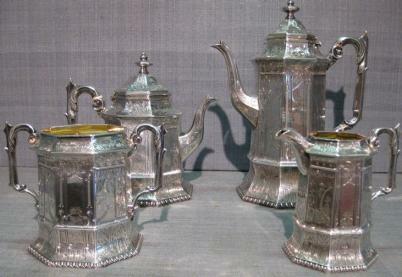 An English sterling tea and coffee service in the Gothic Revival Style made by Joseph Angell, Sr. and Joseph Angle, Jr. of London, 1849-50. All of the pieces are very finely engraved with gothic motifs which include: columns, trailing vines, and tiny figures and animals. The set is in remarkably fine condition and has never been monogrammed. Fully and correctly marked. The interiors of the cream pitcher and sugar bowl are gilded.